Coincidence, when random, can explain pi recurring in research results, in archaeology and elsewhere. Coincidence does not easily explain this finding, with too many coincidences in one relationship set. Three monuments, each a center of a civilization, each the largest center of civilization on a continent (albeit only two of the three at once), and each monument ranking in some largest category for its time and place. This is not a comparison of cities, rather the very centerpoints of their largest monuments present the precise ratio of pi. Accuracy is one way to assess the probability of coincidence. On the global scale, accuracy is an applicable method. 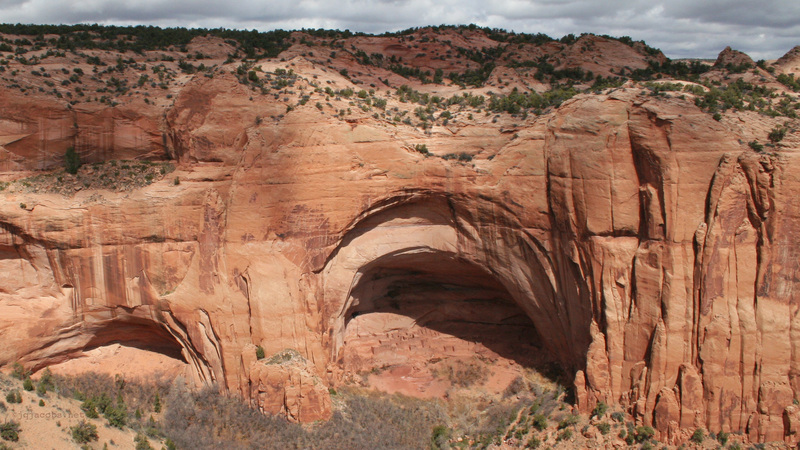 The monument center-on-center arcs precisely express the ratio one to pi. Precise, in this case, means as accurate as the method of determining the coordinates. Using my research application (spherical trigonometry), the shorter arc result is within 4m of precisely equaling the larger arc divided by pi. 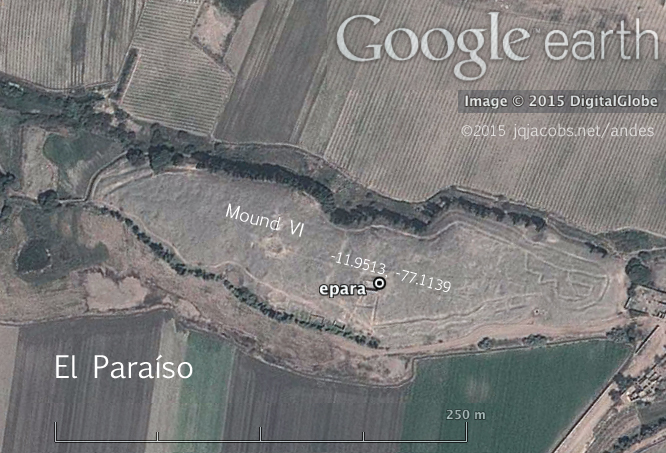 El Paraiso IV, the largest mound at El Paraiso, is over 400m long and the four meters of inaccuracy is in relation to earth's circumference, over 40,000,000 meters. In other words, the prehistoric pi ratio is accurate to one part in ten million. My math result using the coordinates listed below is 1.0 : 3.141590. Quite an accurate slice of pi, besting anything in history written with little letters during the same time. Piramide del Sol, view is the westward side facing the central avenue. 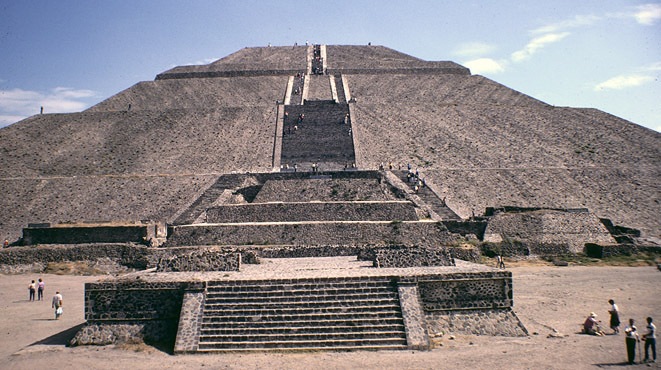 "No other Mesoamerican city had such a large and dense urban concentration before Aztec Tenochtitlan..... By the 200s ... the largest integrated complex of monumental structures in Mesoamerica: the gigantic Sun Pyramid (with a base area close to that of the largest Egyptian pyramid), the Moon Pyramid, the 16-ha Ciudadela enclosure with its Feathered Serpent Pyramid, and the broad 5-km-long Avenue of the Dead..."
About the same time in Xianyang, the capitol of Emperor Qin's newly-unified China, Emperor Wu of Han (156–87 BCE) built Mao Ling, his tomb and the largest pyramid of the Han Dynasty. The Mao Ling Pyramid became known as the White Pyramid when first reported in the West. Built by the largest cities on their respective continents near the same time, the White Pyramid (Mao Ling) and the Pyramid of the Sun are also near the same size. 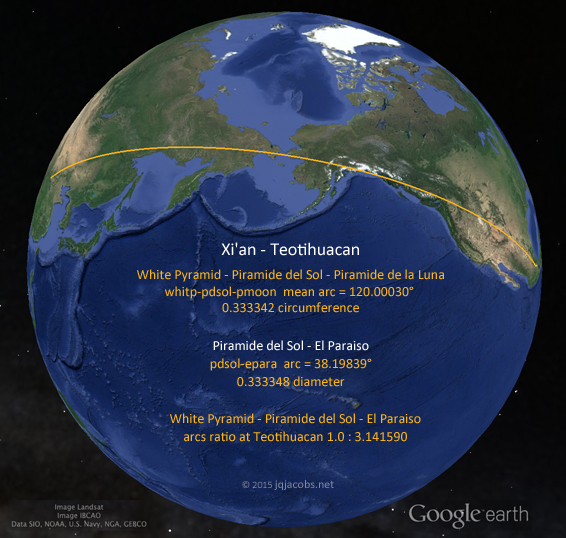 The mean arc distance from Mao Ling (White Pyramid) to the Pyramid of the Sun and the Pyramid of the Moon is one-third the circumference of the earth (120.00030 degrees, within 34 meters of precise). El Paraiso, earlier than Teotihuacan and a unified China, was once the largest of preceramic monuments in the Americas and the largest expression of organization and labor investment at the time. El Paraíso's radiocarbon dates span from 3790 ± 100 B.P. to 3020 ± 60 B.P. (Quilter 1985). El Paraiso, part of a long sequence of monument complexes along the Andean coast in Peru, was an aceramic site contemporaneous with early ceramic sites. For more pi in prehistory, go digging back into previous ArchaeoBlogs. More later with a permalink page and updated KML file. Meanwhile, enjoy the prehistoric pi...there's plenty more where this came from, if you can dig it. 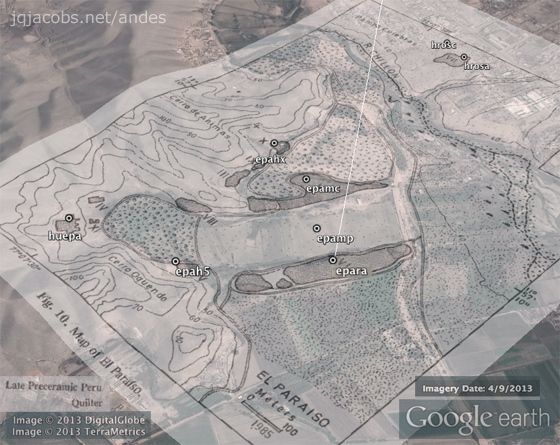 El Paraiso site map overlay, dark-shaded areas are ancient mounds. Cowgill, George 1997 State and Society at Teotihuacan, Mexico. Annual Review of Anthropology 26(1):129–161. Burger, R. L. 1992 Chavín and the Origins of Andean Civilization. Thames and Hudson, London. Fung Pineda, R. 1988 The Late Preceramic and Initial Period. In Peruvian Prehistory, edited by R. W. Keatinge, pp. 67-96. Cambridge University Press, Cambridge. Moseley, M. E. 1975 The Maritime Foundations of Andean Civilization. Cummings Publishing Company, Menlo Park, California. Moseley, M. E. 1978 The Evolution of Andean Civilization. In Ancient Native Americans, edited by J. D. Jennings, pp.491-541. W. H. Freeman and Company, San Francisco. Quilter, J. 1985 Architecture and Chronology at El Paraíso. Journal of Field Archaeology 12:279-97. 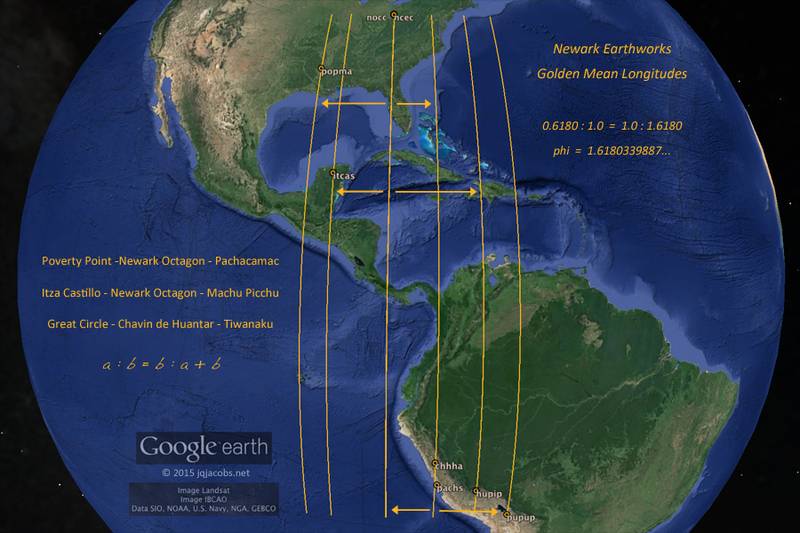 2015.02.12 - I've added more results, data, graphics, and a set of Machu Picchu ratios to the Golden Mean Longitudes KML file. As with the previous two golden longitude triads (discussed below), Newark Earthworks is once again one of the monuments involved. Thus, six major American monument complexes have three golden mean longitude ratios with Newark Earthworks, adding Machu Picchu and Chichen Itza to Poverty Point, Chavin de Huantar, Pachacamac, and Tiwanaku. The Golden Ratio is x : 1 = 1 : x + 1, stated numerically 0.61803... : 1.0 = 1.0 : 1.61803..., where phi, an irrational number like pi, equals 1.6180339887.... Basically, the golden mean whole is proportional to the longer part as the longer part is to the shorter part. Could this longitudinal arrangement with golden mean ratios of known astronomy sites have function to astronomers? 2015.01.17 - On a continental scale, three of the greatest monumental sites in the ancient Americas precisely express the ratio of a fundamental astronomical constant, the number of lunar orbits per earth rotation. In this case the ratio expressed is lunar orbit per ten rotations (illustrated below, click image for larger view). With the ten times multiple, the two arcs provide scales nearly 2,400 and over 6,500 kilometers long with a five meter inaccuracy in relation to the precise constant. 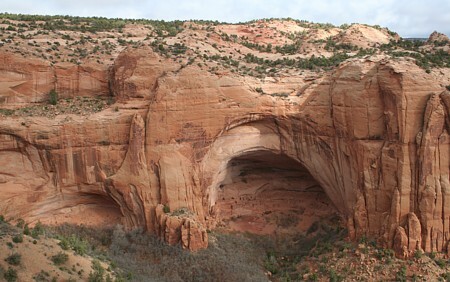 The center-on-center arc inaccuracy is about the same as the inaccuracy in the method determining the monument centerpoint coordinates, and is minute in relation to the scale of the monuments. Comparing monuments on a global scale, I employ centerpoint coordinates. 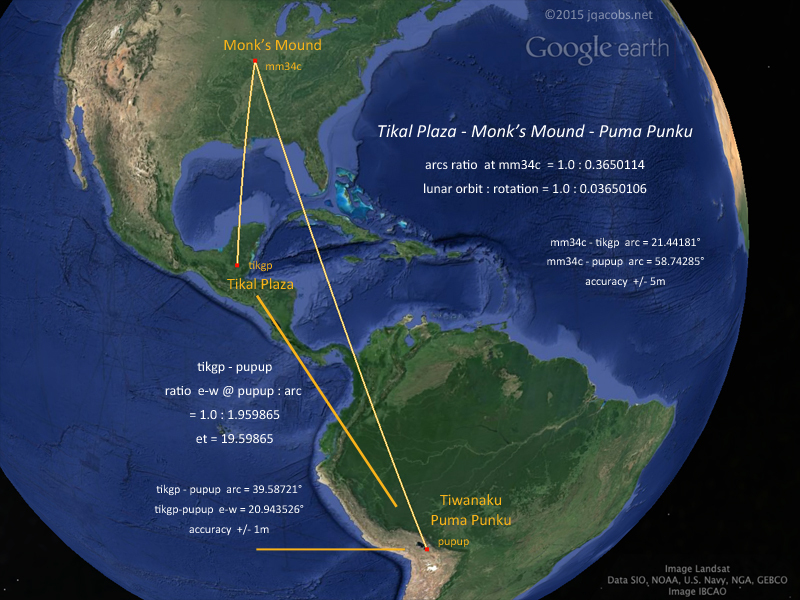 Substituting either of the Tikal Great Plaza pyramid coordinates for Tikal Plaza (their midpoint) shifts the 2,400 kilometer arc 10 meters in either direction. Correlating the two arcs to the precise astronomical ratio, at Tikal Pyramid II the Cahokia arc is six meters long compared to 16 meters short at Tikal Pyramid I. While precision is not intention, the relationship is not a singularity either. With an interesting addition, the lunar orbit per ten rotations ratio repeats in the relationship of three major monuments in the Andes; Pachacamac, Sechin Alto, and Marcahuamachuco. At Marcahuamacucho's Castillo complex the arcs to Sechin Alto and Pachacamac expresses the same lunar orbits per rotation ratio (arcs ratio @ marcc = 1.0 : 0.36500). The interesting addition, at Marcahuamacucho's Monjas complex the arcs to Sechin Alto and Pachacamac express the lunar orbits per day constant (arcs ratio @ marcm = 1.0 : 0.36600). In 365 lunar orbits there are 10,000 rotations. In 366 lunar orbits there are 10,000 days. As noted in the graphic above, the Tikal-Tiwanaku relationship of the same two coordinates (tikgp-pupup) expresses the ratio of eclipse nodal intervals per lunar orbit turn (et), again a precise astronomical ratio. The Newark-Pachacamac relationship expresses this constant redundantly plus the Pachacamac to Newark Circles mean arc (pachs-nocc-ncec) equals four times lunar orbit per rotation, in other words four times 0.036501 circumference. The relationships are illustrated below and previously discussed in Newark Archaeogeodesy. For more on the importance of lunar motion per rotation, the readily-observable, fundamental astronomical ratio, see Eclipses, Cosmic Clockwork of the Ancients. 2015.01.17 - An updated v2015 of archaeogeodesy.xls is online, with the site variables set to the finding discussed above. The applet provides ancient astronomy research functions and calculates arc distances and bearings for three sites, ratios of arcs, latitude, and longitude, and more. The thousands of site coordinates for mounds, pyramids, and other monuments worldwide include hundreds of newly documented Amazon geoglyphs. 2015.01.14 - I recently focused on the ancient pyramids in East Asia, including Emperor Qin's mausoleum. The massive Qin Shi Huang pyramid was also a focus of my latitude study. Several new files illustrate the findings. While not as precise as the latitude placements of Chavin (asin 1/6) and Monk's Mound (atan 4/5), or the nodal to anomalistic colatitude ratio of the Octagon and Capitolium, the Qin monument does overlap two significant latitudes, the golden mean between the equator and the pole along with three-fifths of a radian from the equator. Will these baselines inform locating the actual tomb? Examine the details in a new Google Earth file, qin.kml. At the Qin Shi Huang pyramid, the latitude equals 0.600067 radians and the colatitude to latitude ratio is 1.0 : 0.61816. The two baselines transect the pyramid field north of Xian, passing just north of the Yan Ling Pyramid (yalip, latitude = 0.59996 radians, = 0.61806 colatitude). At the phi baseline, the ratio of distance to the pole and to the equator is one to phi (1.0 : 1.618034 = 0.618034 : 1.0). This equals the ratio at the pole of the distance to the equator and to the baseline, thus the golden mean (φ = 1.6180340). Two arcs are a golden ratio if their proportions equal the ratio of their sum to the larger arc, in this case [lat : colat = colat : (lat + colat)]. 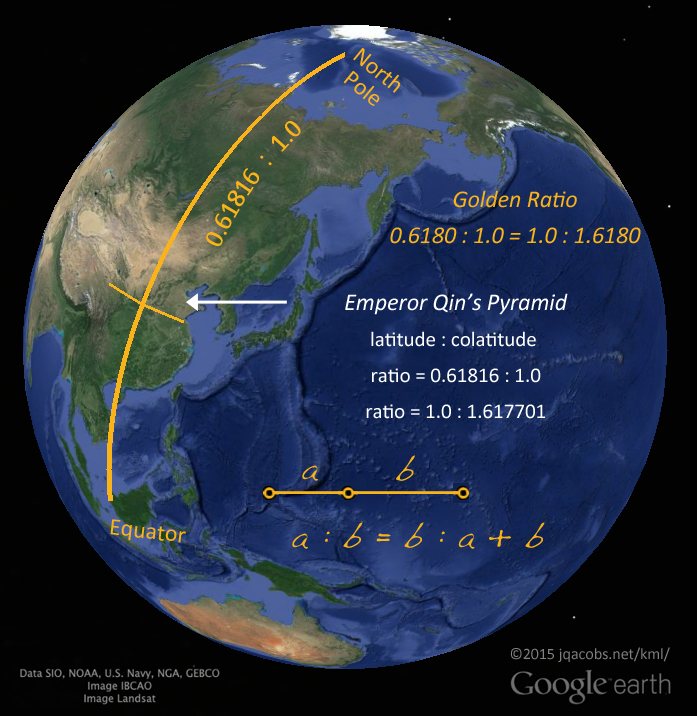 The golden mean latitude of Qin's mausoleum, feng shui on a global scale. Download qin.kml. The golden ratio latitude of Emperor Qin's mausoleum is not my first observation of this ratio for major monuments. In the Americas, I noted two phi longitude ratios for Newark Earthworks. 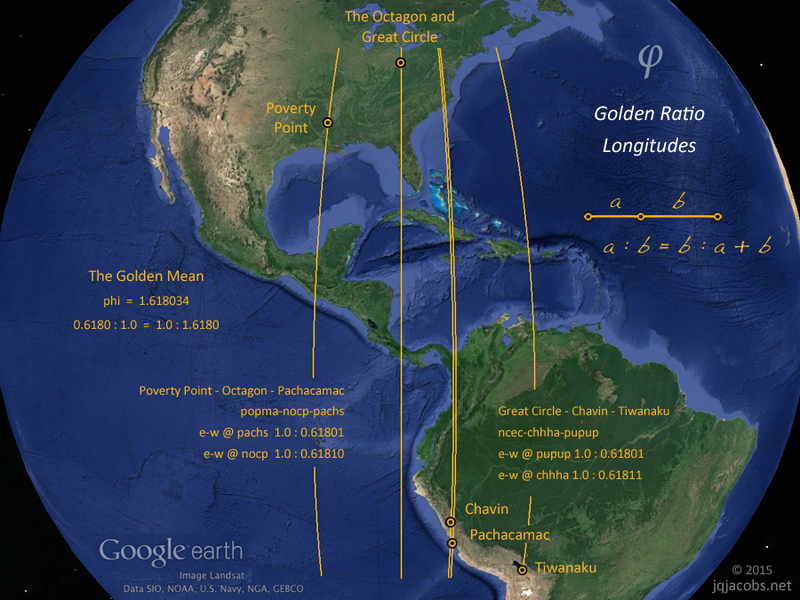 The golden mean is accurately expressed by the longitudes of three major monuments, Pachacamac, Newark Octagon, and Poverty Point (pachs-nocp-popma e-w @ pachs = 1.0 : 0.61801, e-w @ nocp = 1.0 : 0.61810) and repeats for the longitude differences between Newark Circle, Chavin, and Tiwanaku (ncec-chhha-pupup e-w @ chhha = 1.0 : 0.61811, e-w @ pupup = 1.0 : 0.61801). 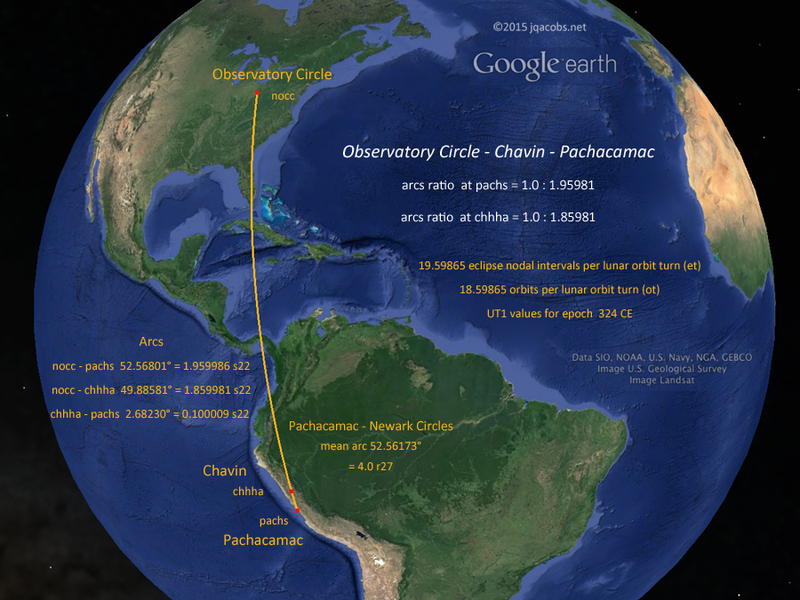 The distances from Newark and Chavin to their respective opposite poles only approximates the golden ratio, while their relationship with Pachacamac presents a very accurate astronomy ratio (as previously discussed). Here follows a new graphic illustrating the arc (click to enlarge). A permalinked page with further discussion and other site-to-site results will follow. For now, I wanted to start the 2015 blog in order to post new and updated files and to report these findings—the tip of an iceberg. 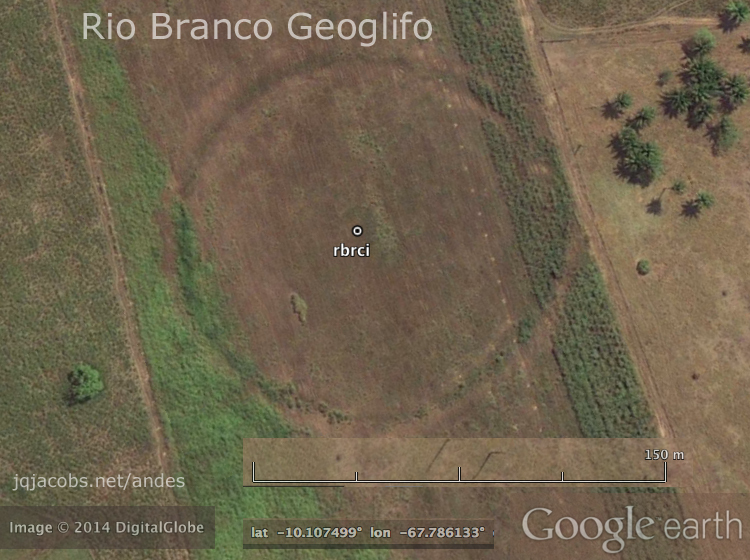 2015.01.06 - Hundreds of Geoglifos Discovered in the Amazon article updated with newly discovered geoglyphs. 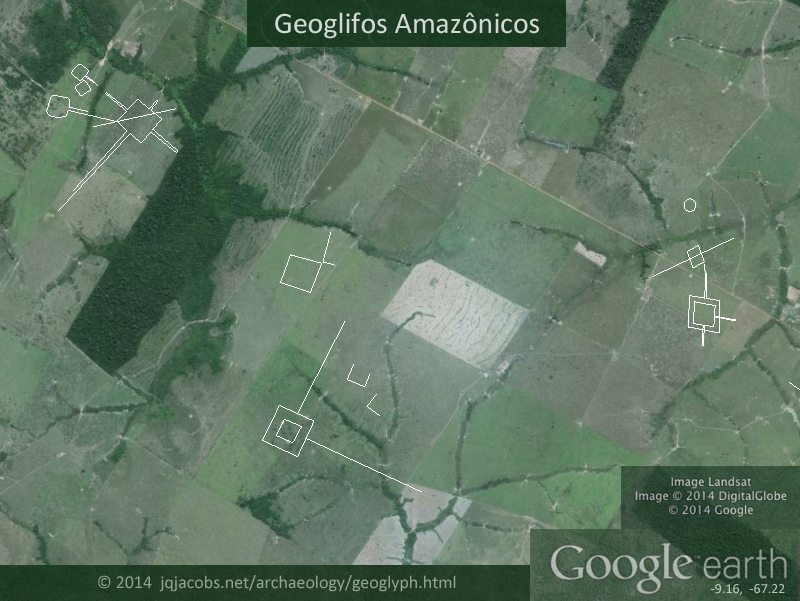 Nearly 400 Amazon geoglyphs are now surveyed. All the visible lines and the largest earthworks are outlined. I continue to monitor Google Earth imagery updates. 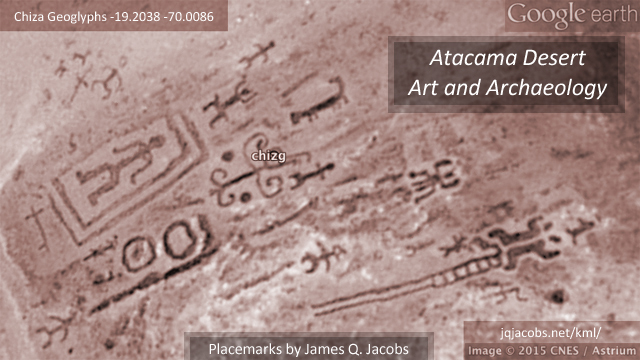 2015.01.06 - Atacama Desert Art and Archaeology placemarks file posted. Zoom in on geoglyphs and enjoy selected photography, follow caravan trails and associated rock art, and enjoy an aerial tour of antiquity. This is a first-time survey of the region for me, so please pass along significant locations I missed. 2015.05.06 - Google Earth updated imagery in several areas along the periphery of the known Amazon geoglyphs. The interesting new geoglyphs in the geoglyphs_2015.04.kml file include a long oval and a large oval. Please pass along any geoglyphs I missed. 2015.07.14 - Google Earth KML file illustrating the arc distances ratio from Teotihuacan to Tikal and to Tonina. 2015.10.12 - Celebrating Indigenous Peoples' Day, I decided to publish a Google Earth KML file of the current sites database with a correlated XLS applet version. The database includes near 4,000 coordinates. This is the first KML file online to include the entire sites database. The KML format does not embed some of the maps included in the KMZ versions in the Ancient Monuments Placemarks listings, but it is a complete and current sitelist with functional code terms in the correlated applet. Southwest 2007 Travel Posts - Betatakin 2560 x 1440 deskpicture (1.25 MB). Eastern Woodlands GPS Placemarks w/ Squier map overlays. "Antiquity willfully veils the truth so that the fool will go astray and only the wise may know." Phaedrus, writer of fables, writing in Rome. © 2015 by James Q. Jacobs. All Rights Reserved.